©Barry Sandland/TIMB – There is a sense of pure Brit in this image. From the dress to the style, I suspected I was following a Brit to the Eurostar Terminal to get the picture. “I use it pretty religiously around London and just thought for this visit to Brussels I would branch out and see how it went in a new city. I left myself plenty of time to get lost. Actually I think, on balance it is probably been still a lot quicker to take the bike everywhere… It is quite handy having a Brompton. How could I not try and get a photo of this man? 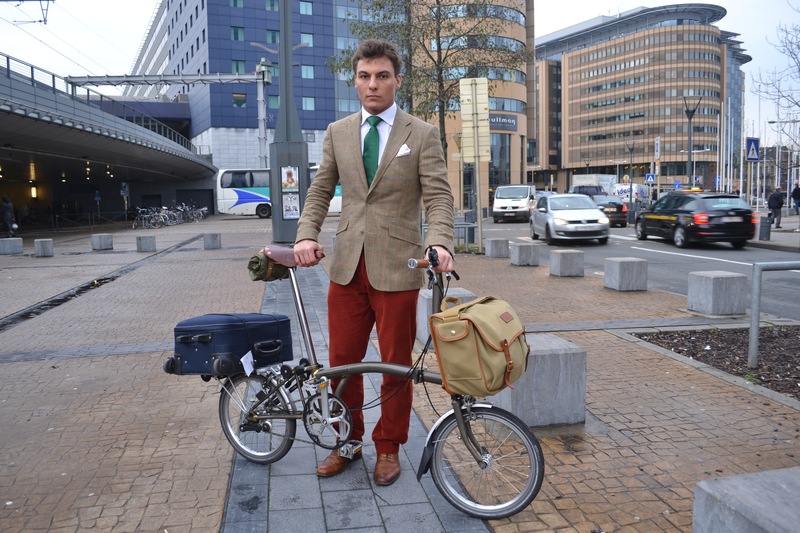 He rode by in his sartorial splendour and everything seemed British – and I followed him to the Eurostar terminal for the shot. He is a sea of calm. I tend to see travel with a sense of urgency. Departures and schedules and, all seem to bring a sense of urgency to me. This man was ahead of schedule, calm and easy about the request, the image. The sort of person who brings calm to other people. He had managed to have a small crash while here … these are his travelling clothes. This entry was posted in Europe, foldable and tagged Brompton, December, UK. Bookmark the permalink.